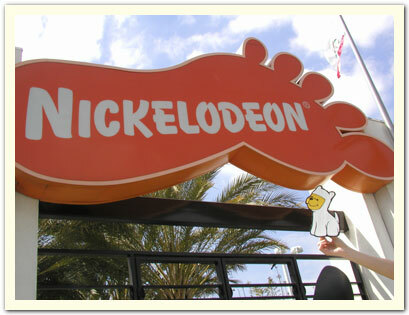 Bumperpup visits the Nickelodeon Studios in Burbank, CA. April 2005. Photo taken by Ben C.
Bumperpup meets Ben Zhu of the Nucleus store and gallery in Alhambra, CA. You can't tell from this picture, but there is awesome gallery space in the back! April 2005. 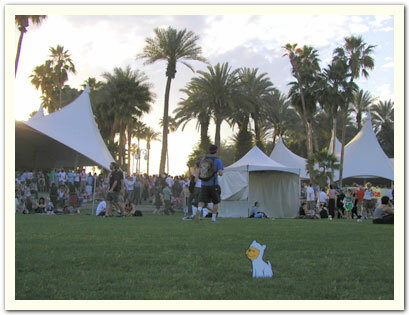 Photo taken by Debbie H.
Bumperpup beats the heat at the Coachella Music Festival in Indio, CA. 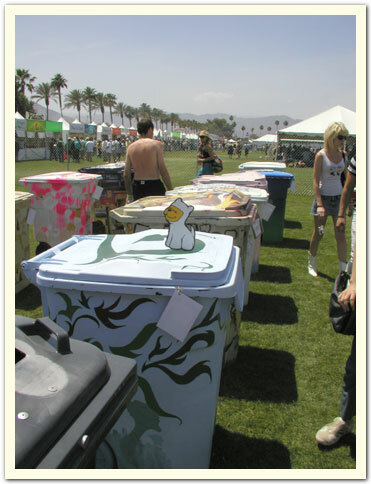 Also at the Coachella Music Festival was an exhibition of recycling cans customized by 100 talented artists. Bumperpup poses on the recycling can of Benjamin Collison.